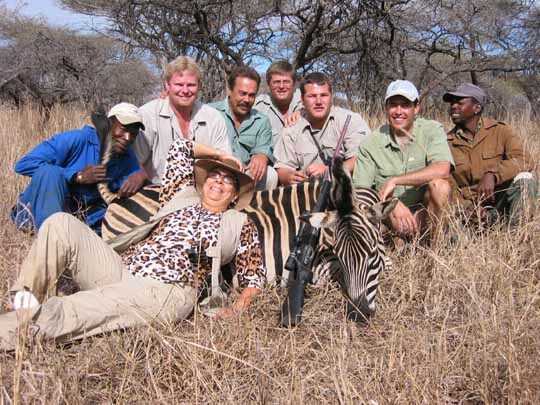 We booked a hunt with my friend Peter Harris, of Ntshonalanga Safaris, and on June 11th, Mona, Anna-Marie, Mohamed, Horst, Walter and myself boarded our plane to Johannesburg, to meet up with Alan who has driven there from Zimbabwe. We had absolutely no hassle at either Dubai or Johannesburg airport with our rifles, clearing them through customs in a few minutes. All they checked in South Africa was the serial numbers of our rifles, and asked about the quantity of ammo we were bringing, but did not check it. The drive to the hunting area took us over 6 hours, including several stops for food, drink and petrol. The traffic was quite heavy, and we were all very happy to get to our camp, and meet Peter and Dave. The married couples had a roundel each, while us bachelors were allocated a room each next to each other. Walter got # 13! This is the first of a 3 area hunted. 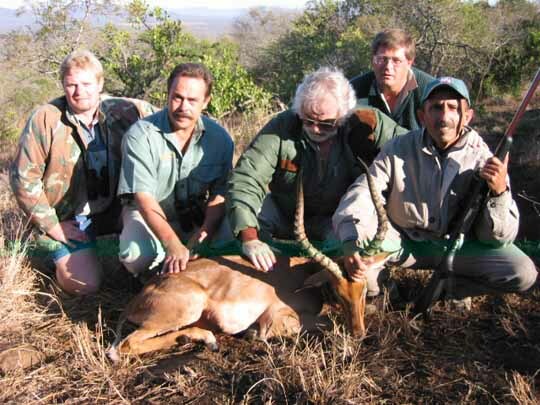 This hunt was conducted at the Bayala Game Lodge, in Hluhluwe, Zululand. 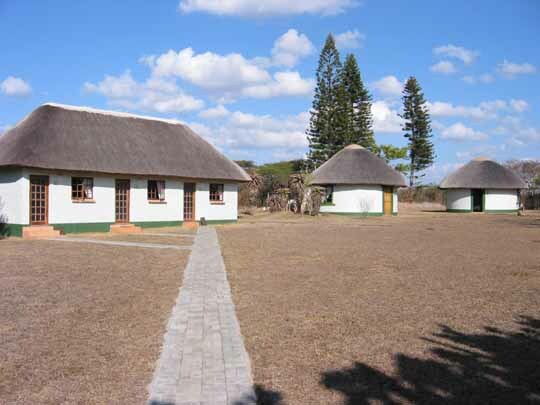 This is part of our camp. The two married couples stayed in the roundels on the right, while the bachelors, Walter, Alan and myself, stayed in the 3 rooms in the building on the left. The rooms were numbered 11, 12 and 13. We gave Walter # 13! 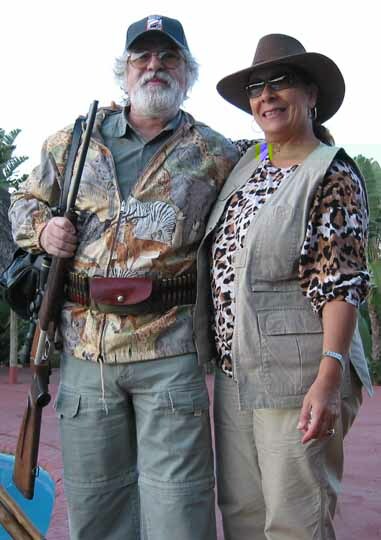 I brought a rifle I built specifically for this hunt, while Walter brought his Blaser R-93. Mine is chambered for the 30/404 wildcat cartridge, and built on a Sako 75 action. It has a Hart 27.5 inches stainless, fluted barrel, and installed in a McMillan stock. A Leica 4.5-14 scope was installed in Talley bases and rings. And his is a Balser R-93 in 7x64. I wanted to check the performance of different bullets on game, so have loaded a few of each of the following: Sierra Match Kings, Nosler Ballistic Tips, Trophy Bonded Bear Claws, Swift A-Frame and Nosler Partition bullets, all in 180 grain. The load I used for all of them is 90 grains of Alliant Reloader 22, which gave me a velocity of 3430-3480 fps, depending on the make of bullet. After we had our light breakfast, we went out to hunt. And not far from the camp, we saw this reedbuck running in the bush. Peter and myself jumped out of the truck and chased him. A little while later, we saw him looking at us from about 80 yards. I rested my rifle on Peter's shoulders, and fired a 180 grain Sierra Match King at him. We heard the bullet hit him, he turned around, ran a few yards and dropped. We found the bullet had hit him on right shoulder, going through and exiting the other shoulder, after breaking the bone and making a large exit hole. A while later we saw this nyala bull looking at us through the thick bush they seem to like so much. I fired a 180 grain Match King at him, dropping him in his tracks. 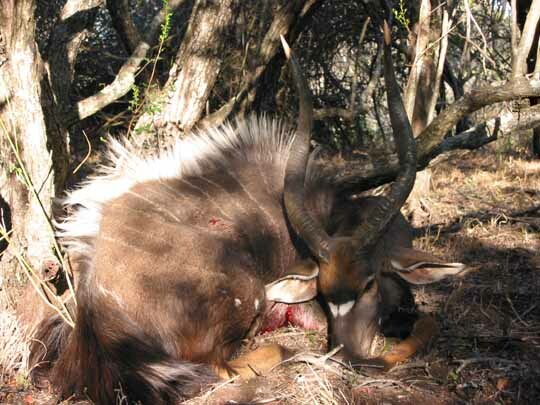 We found that the bullet had hit a branch very close to him, and cut a furrow through it, and then hit this nyala in the neck, as he was facing us. Fragments of the bullet we found as shown in the photo below. 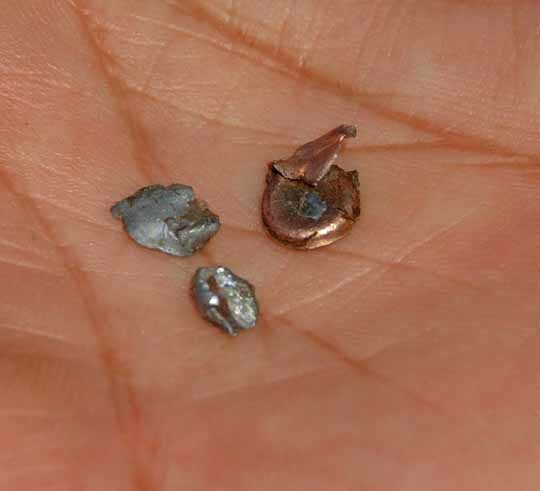 These are the pieces of bullet we recovered from the nyala shot above. The round copper part on the right is the end of the boat tail, and two tiny pieces of lead. 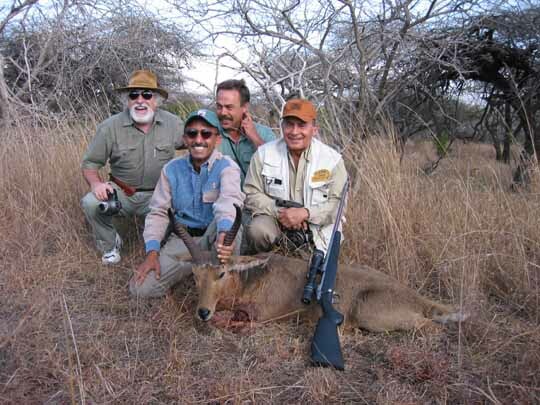 Dave, Peter, Alan and myself walked into the forest and Dave starting calling for red duikers. After a little while, this nyala bull appeared to investigate that funny sound Dave was making. 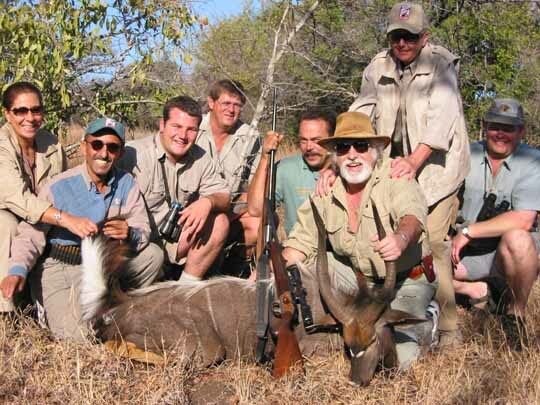 Peter whispered to me to shoot it, as the nyala was no more than about 20 yards from us. He was partially hidden behind a tree, but there was just enough clearance to place a 180 Match King through his heart. He ran about 5 yards and dropped. 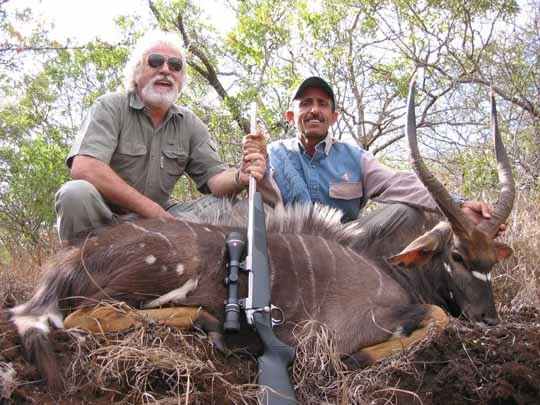 Walter and a nyala bull he shot. From left, Mona, me, Drum, David, Peter, Walter, Anna-Marie and Louis. Walter used his beloved Blaser, which was fine for 40 yards shots, but once you add another zero to the range, he refuses to shoot it! Walter stated that this was the very best hunt of his life! He did not have to contend with Roy and me screaming at him to jump out of the truck and start running after a disappearing animal into the bush. All he had to do is make himself comfortable on the back of the truck, tap on the hood for Peter to turn the truck in the right direction, and then all he has to do is shoot. All without even trying to move out of the truck! 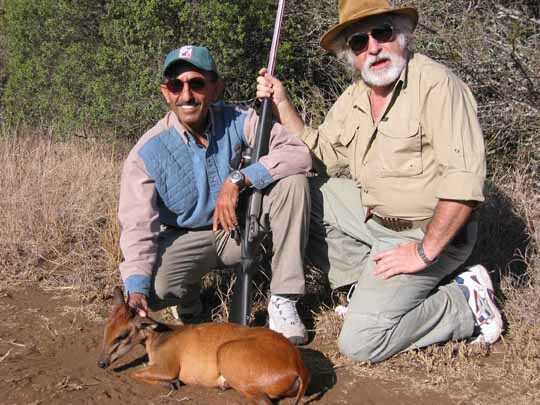 I shot this red duiker at about 270 yards. Walter said he was very proud to be my friend then! We were driving along when we saw this red duiker standing on the road ahead of us. Drum, looked through his glasses, and announced the fact that it was a male, and I should shoot it. Another victim that fell to the Sierra 180 grain Match King bullet! The bullet took most of the other side with it as it went out, and pieces of flesh were scattered all over the place. Walterhog and his name sake! 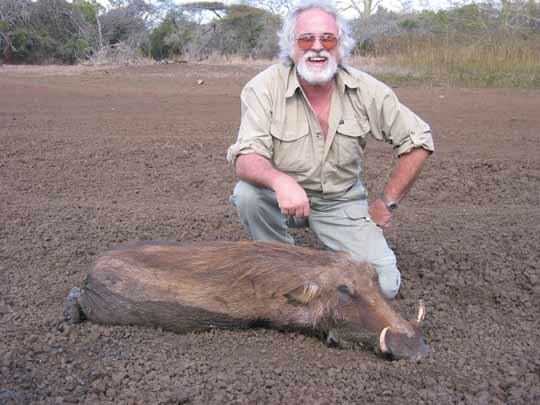 He whacked this warthog while it was in the mud. It did not even move at the shot. We drove up to a waterhole, made ourselves comfortable in the back of the truck, and waited for a victim to appear. It was not long before a few warthogs appeared, and this was one of them. 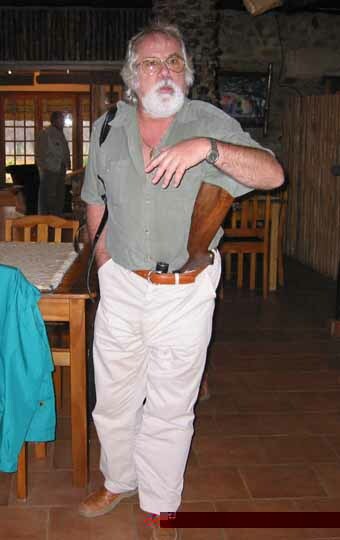 Walter did one of his usual tricks with his Blaser - it misfired! Somehow the warthogs did not hear the click of the firing pin - they were too busy extricating themselves out of the mud! Well, this one did not make it, as he stood there waiting for Walter to get his act together with that silly imitation of an over engineered, over priced piece of German plastic, wood and steel to fire. 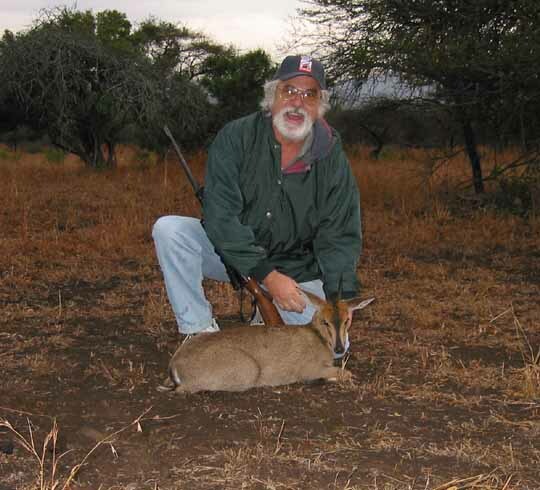 Walter and common duiker. We were driving along when we saw this duiker in the bush. It was about the right size and distance for Walter to shoot with that little rifle he has, so he whacked it. 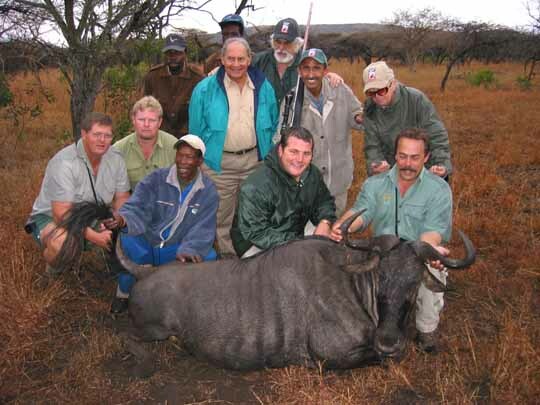 I shot this blue wildebeest at about 100 yards. We recovered part of the jacket of the 180 grain Sierra Match King bullet used on him. As you can see, it was a bit wet that day. How Walter carries his rifle on the hunt. He says this confuses the animals, as they cannot see his rifle! Walter and Mona in their camouflage dress! I think if I was an animals I would probably die of laughter after seeing these two! One of two zebras I shot together. One was an old mare which had one eye blind, and was in a rather poor state, and this one, which was just as healthy as they get. The usual gang. Mona in front, Rommel, Louis, Peter, Drum, Alan and a tracker I did not get the name of. I shot this impala at some ridiculous distance while he was feeding on a mountainside. I could not see him with my naked eyes, and even Alan could not see them very well with his 10 zoom camera. It was one of those lucky shots again, which impressed Walter no end! Louis did not believe I was going to shoot it at that distance. 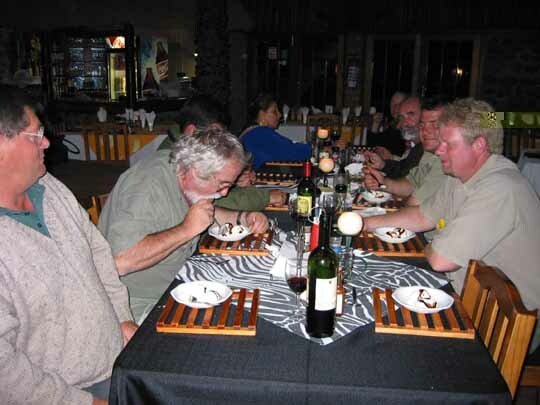 We are enjoying our last dinner at Bayala, and Walter is having a double helping of vanilla ice cream and hot chocolate!